Maryland Shingle has a wide selection of colors for wrapping the wood trim on your home. Capping wood trim can pay for itself over the course of time and increase the value of your home. 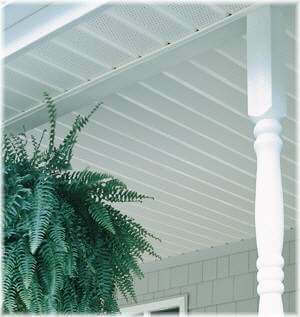 Tired of the yearly grind of scraping, priming and painting your wood trim? What if Maryland Shingle could show you a way that would keep you off that dangerous ladder and stop the mounting cost of painting your trim every couple of years? Sounds too good to be true, doesn't it? Well, throw away that paint brush and break out the lawn chair, it's no dream! Maryland Shingle can trim wrap all of your wood trim with one of our 31 colors of PVC coated coil stock. Maryland Shingle's highly skilled installers will trim wrap your wood trim, door frames, window frames, soffits, rake boards, frieze boards, dormers, bay windows, corners and virtually any wood on the exterior of your home. But beware, not all trim capping is created equal! Rather than just boxing everything squarely around rake boards, window brick molding, door brick molding and other wood trim, the highly skilled crews at Maryland Shingle bend our capping to give detail. Fabricating this type of detail in wood trim capping takes time but the staff at Maryland Shingle Roofing & Siding feel the results more than justify the extra time spent on a quality job at your home. This beautiful trim wrap metal work is accomplished by a specially trained trim wrap installer and the use of a portable metal bending machine. As you know, the operator behind the tools is the real reason behind any great looking job. A lot of contractors can bend metal around your wood trim but few can match the beautiful detail work of a Maryland Shingle job! That’s why we stress quality workmanship on every job and it shows. This special attention to detail takes a little longer but the gorgeous results are what separates a Maryland Shingle job from the competition. Let Maryland Shingle Roofing & Siding Contractors show you how a one time investment in trim capping your home can keep you off dangerous ladders and free you from the constant worry and cost of wood trim maintenance. Call today to schedule a free no obligation assessment of your home!